Home » Collections & Research » Museum Collections » George Hoshida Collection » 3-8-44, 8 PM, Block meeting, Jerome R.C. 3-8-44, 8 PM, Block meeting, Jerome R.C. 2 drawings on paper (1 sheet) : ink ; 9.5 x 6 in. 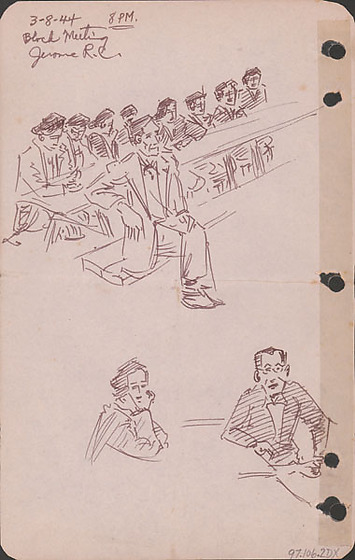 Ink sketches of two scenes from a block meeting at Jerome Relocation Center, Denson, Arkansas on March 8, 1944, 8 PM. Top sketch of ten people seated at a long table with benches receding to the back right. Nine figures are seated on the back bench, while one man in a suit is seated with crossed legs on the front bench. Drawing 97.106.2DW on recto of same sheet. Written in black ink, top left: 3-8-44 8 PM [underlined] / Block Meeting / Jerome R.C.